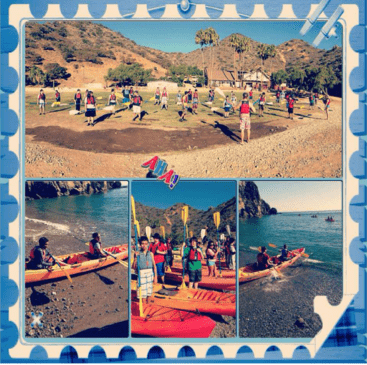 Four adults chaperoned a terrific field trip to Catalina Island for 26 TIA middle school students in September 2013. A lot of fun learning can occur outside of classroom walls. The students that went on the Catalina Island trip will attest to that! After a long night drive through the Arizona desert, the travelers boarded the Catalina Island Cruise Boat in Long Beach, California. Then commenced the windy, choppy three hour boat ride to the island, which included sea sickness episodes for a few. Once they arrived on the island, everyone was too weary to tackle the first scheduled activity of ocean kayaking. They opted to postpone that activity, but instead did some exploring of the beach upon their arrival. One of the adults went to the end of the pier (the only place good cell phone reception was available) to call parents back in Arizona and say they had arrived safely, albeit a few of them a bit green around the gills. The group was housed in beautiful cabins right on the beach and enjoyed delicious meals during their stay. 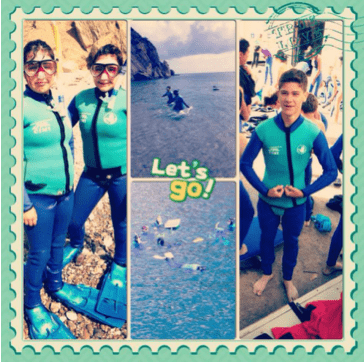 The field trip, in cooperation with the Catalina Island Marine Institute, provided our TIA students with a myriad of exciting and educational activities. In addition to the marine life studies, students also experienced a mind-blowing astronomy lesson studying the night sky from the beach without any city lights to diminish the spectacular view. They also did some hiking up the mountain trials which provided breathtaking views of the island, the ocean, and some incredible sunrises and sunsets.